Say hello to Thunderscape, SSI’s initial attempt at getting into 3D fantasy role-playing. 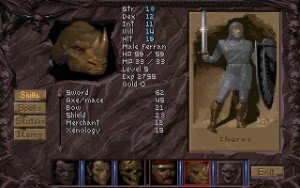 Right from the start I found the premise of Thunderscape more innovative than many other get-the-magic-ring or kill-the-evil-wizard RPGs, although fans will doubtless recognize established elements scattered throughout. Set in the fantasy realm of Aden, an exaggeratedly dark and dreary world, you and your party engage in the requisite turn-based role-playing exercise of killing monsters and hoarding loot. 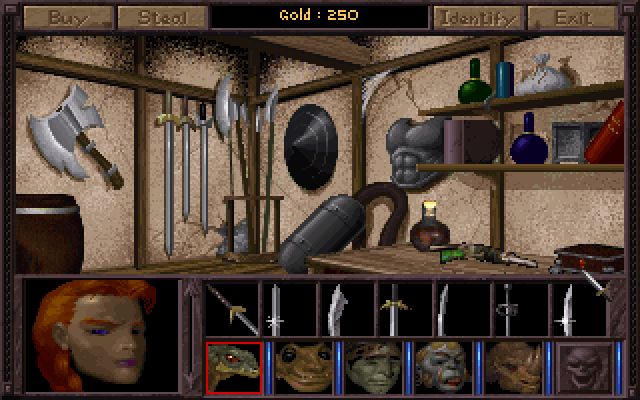 As many as six characters can be in the party, each with different skills and strengths. 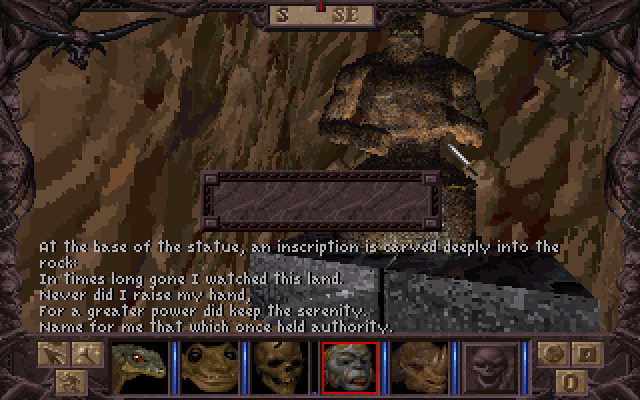 The first-person viewpoint is similar to that found in many other roleplaying or action games, with a free-scrolling perspective. 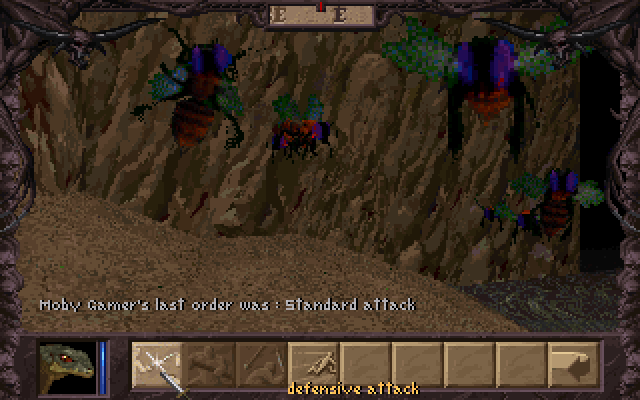 But instead of the tired, mouse-clicking real-time combat, there is a turn-based, almost strategic, interface. 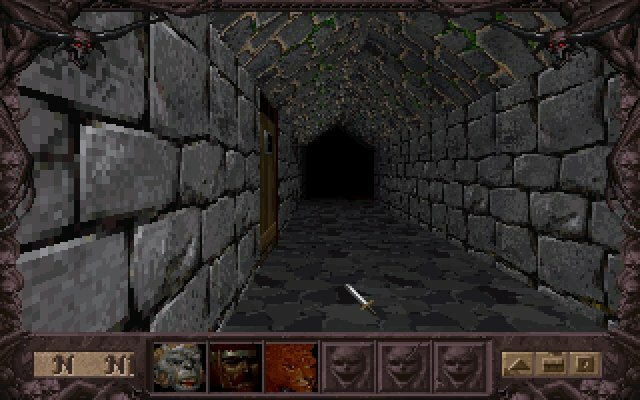 Characters have a number of attack options, such as ranged attacks with bows or guns (hold your breath on that rocket launcher), or standard melee combat with sword slashes, berserk attacks, staff bashes and so on. 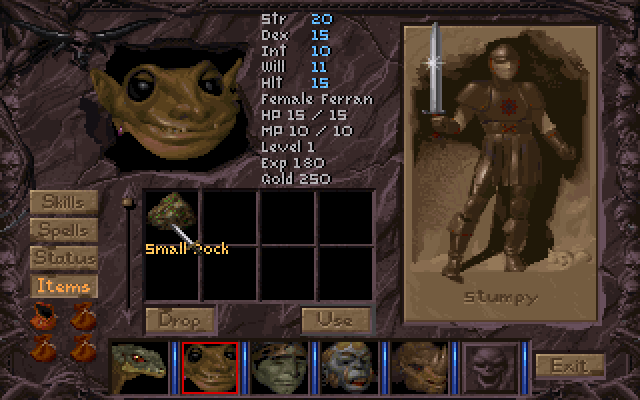 Defensive postures, such as parry, hide, run, and dodge, are also available, often tied to a character’s dexterity rating. 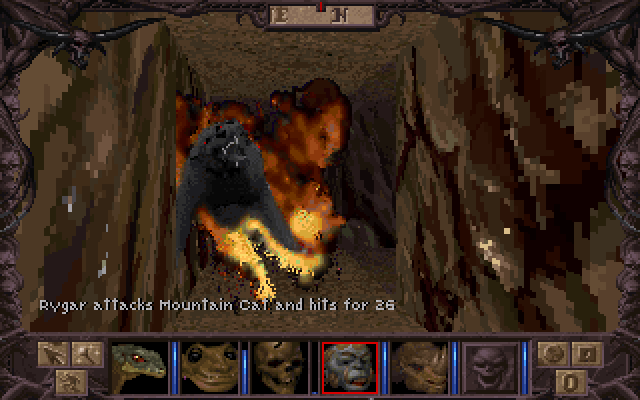 The numerous skills available to characters are also tied to combat actions. Someone who is a good “fast-talker” can try to confuse, bribe, or pacify a foe, while a stealthy thief can slip in for a backstab. 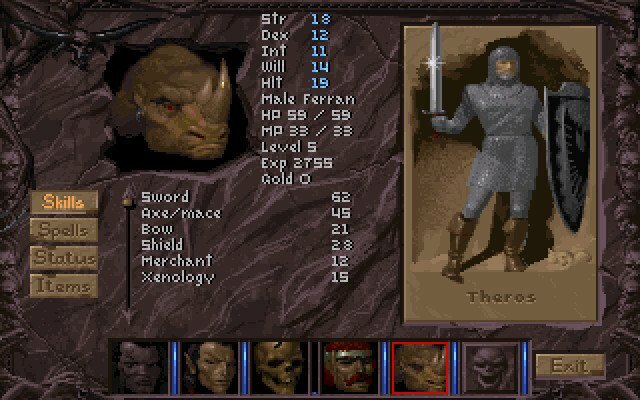 A character with a good xenology rating will know all the stats and vulnerabilities of a monster, revealed by simply clicking on it. Spell use is not confined to class, but is available to anyone who has a rating in magic. The spells are standard fare – heal, hold, ranged attacks, increased abilities, etc. – but can be wielded in or out of the combat phase. 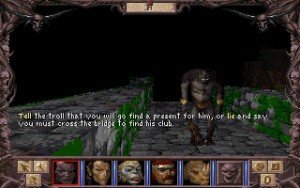 For such a strategically-minded action RPG, this wide range of attacks lend to some nice combat, even though the exploration phase is more than a little sluggish courtesy of some REALLY limited draw distances. Shrouded in eternal darkness, you can rarely see a few feet in front of you. This isn’t always an issue considering the turn-based combat of the game, but it can wreak havoc when you’re navigating dangerous terrain. Puzzles play a secondary role in all of this. 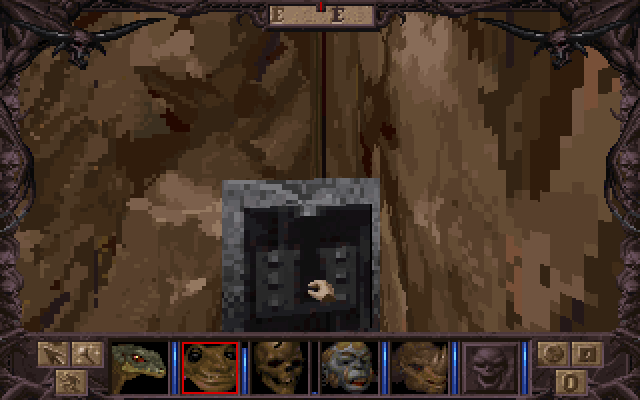 Early on, only a few simple riddles bar entrance to certain places, but more puzzles emerge, with traps, levers, blocks, and other challenges. 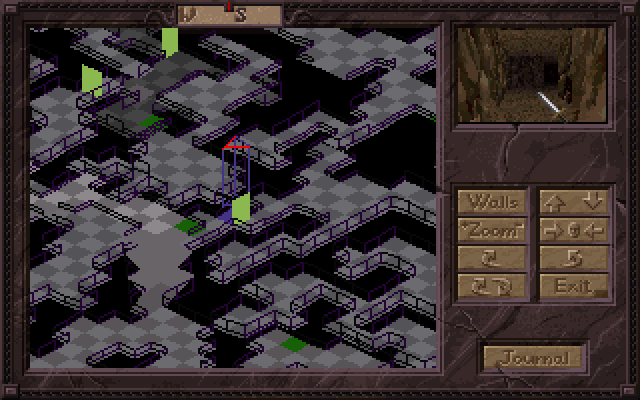 This is somewhat run-of-the-mill stuff, thankfully, and shouldn’t bog most players down if they’re careful. 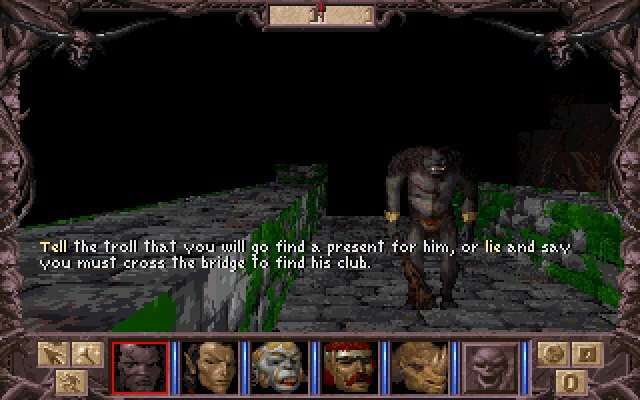 If you enjoy old school dungeon crawls then this game is worthy of recommendation – the 3D engine is extremely dark, and there’s not a whole lot of dialogue or plot, but as far as combat it’s a fairly compelling DOS-dated trip.